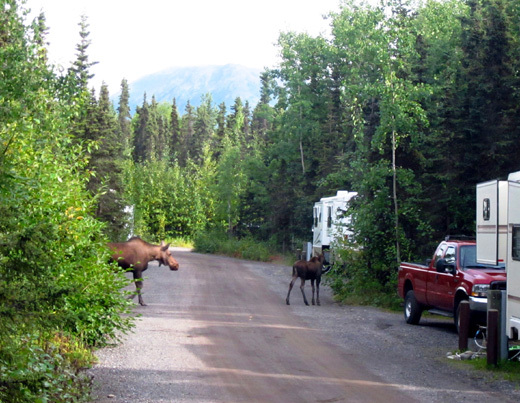 "Visitors to Alaska are more likely to see moose than any other big game. they could charge, and an attack could cause serious injury or death." 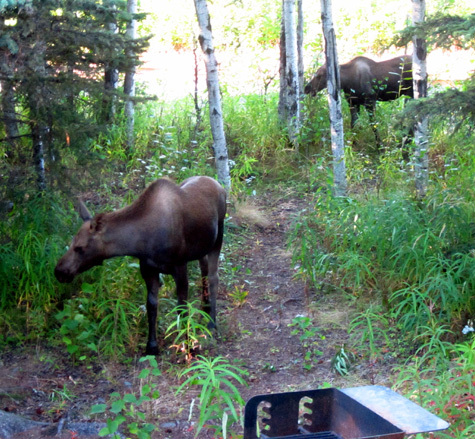 It is so ironic that we've seen more moose in Anchorage this summer than during our eleven days at Denali National Park. 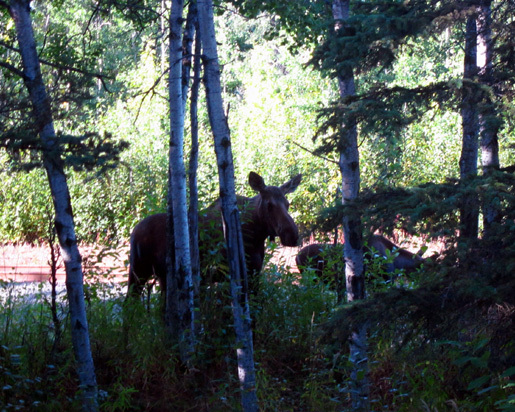 I saw a grand total of one moose at Denali and Jim didn't get to see her. 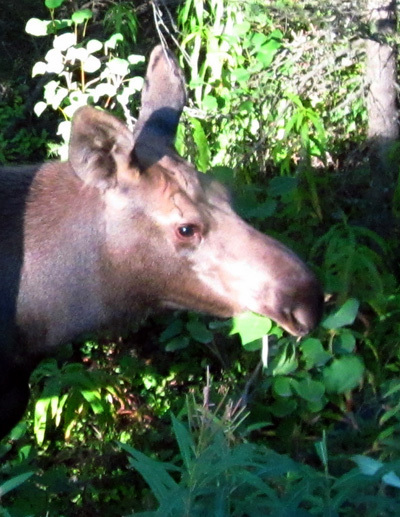 It's estimated that 1,600 moose winter in the city because there is more food to forage there than in the nearby mountains. 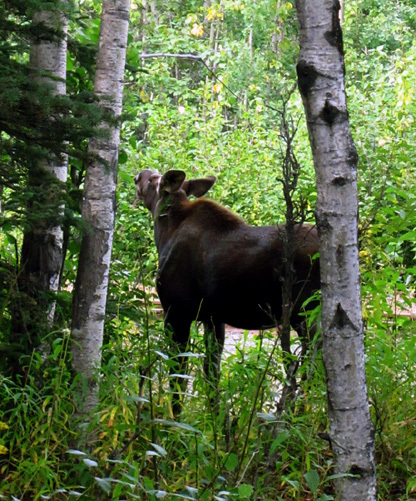 Although there are fewer moose wandering the city greenways, parks, neihgborhoods, and JBER in the summer, we've been privileged to see a bunch of them in our three visits here. 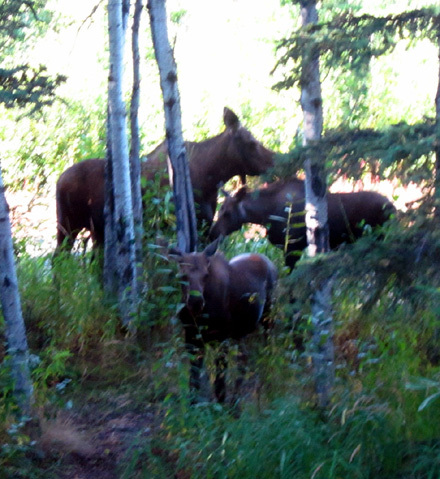 This was a great day for moose sightings and Jim had the pleasure of seeing even more than I did. 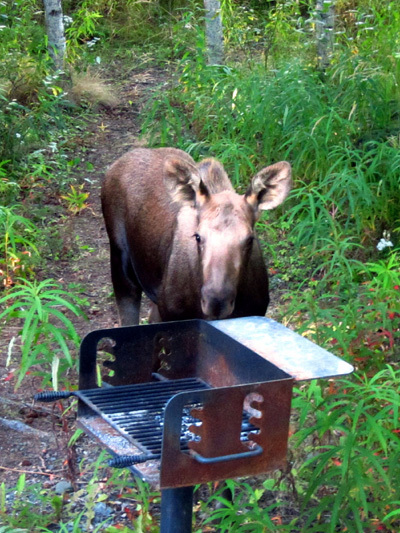 Later in this entry I'll show photos of the moose Jim saw on his bike ride and our resident mama moose and twins that visited our campsite tonight. 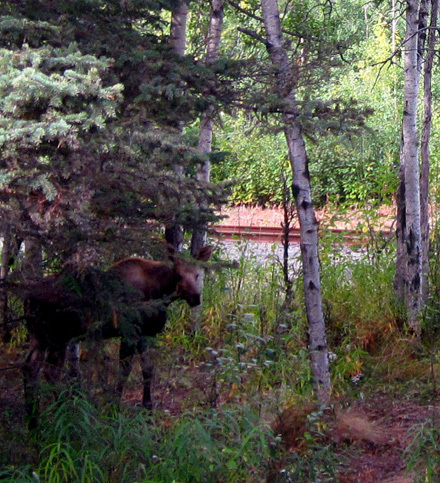 I'll also throw in photos of another visit later in the week by the campground moose. Today�s weather was perfect and we both took advantage of it. More about that in the next entry. While I was wandering in the mountains Jim had a memorable 42-mile bike ride from the campground to Kincaid Park and back. He wanted a really long ride today while the weather is good. 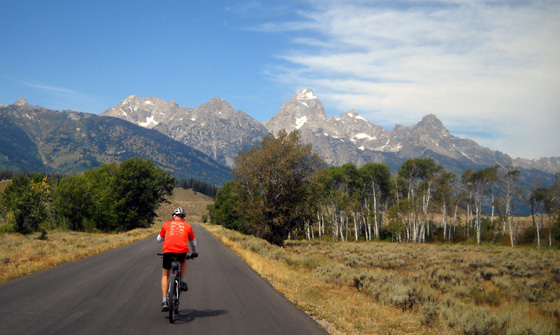 He�s building up his distances so he can ride the 109-mile long Michelson Trail when we�re in Rapid City this fall. 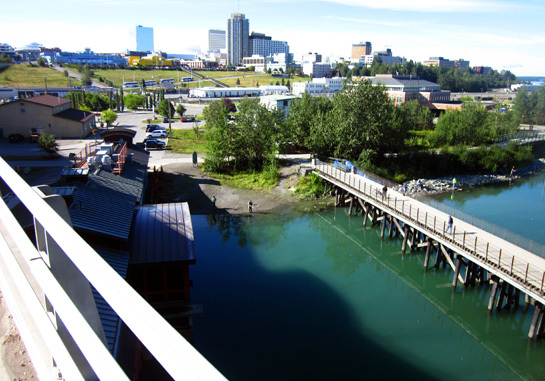 He rode Arctic Valley out the west side of JBER and made his way down to the Coastal Trail through town like he did once previously when we were here. 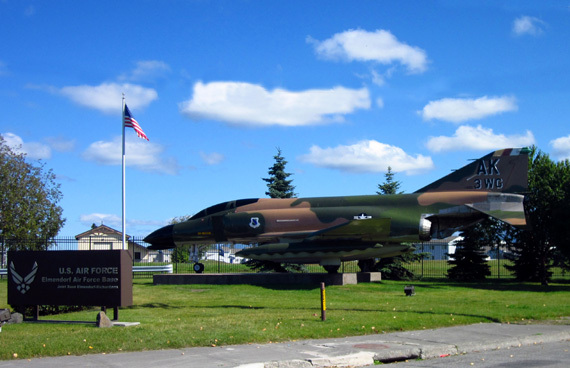 planes' electronic counter measures (ECM) for a decade in the Air National Guard. 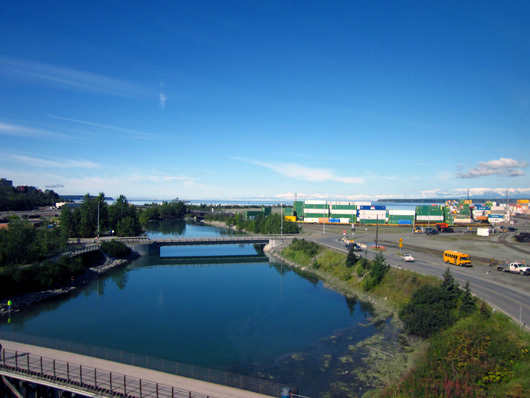 View over Ship Creek to commercial dock (R in distance); note the colorful stacked shipping containers. 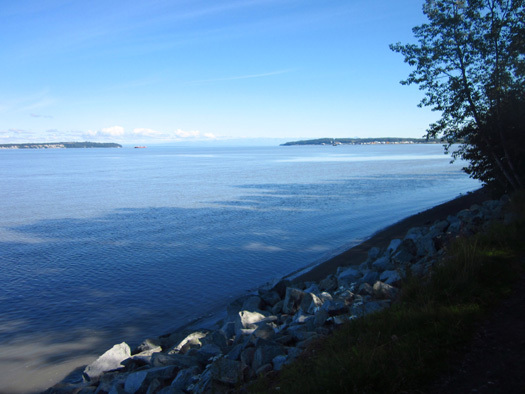 After crossing the creek Jim rode on city streets a few blocks to reach the north end of the paved Coastal Trail, which he followed for eleven miles to Kincaid Park. 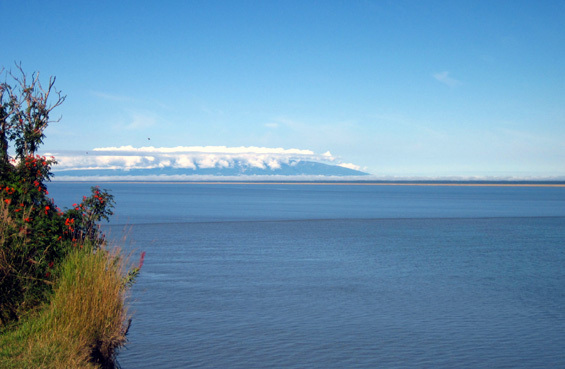 Above and below: looking north across the Inlet toward the Alaska Range in far distance. 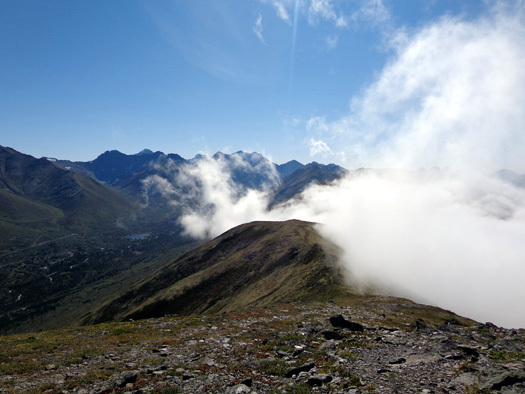 You'd think on a pretty day like today you could see Denali, but it's hiding under those clouds. 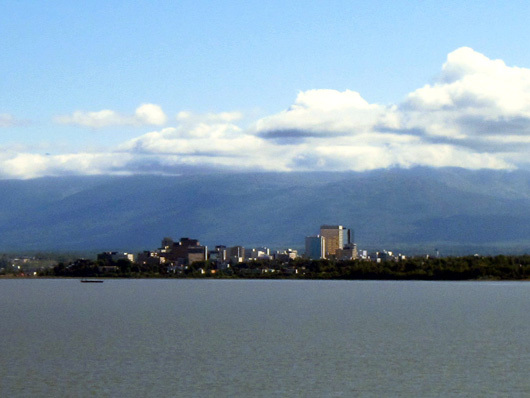 View NE to downtown Anchorage and the Chugach Mountains; I was up on one of those ridges. 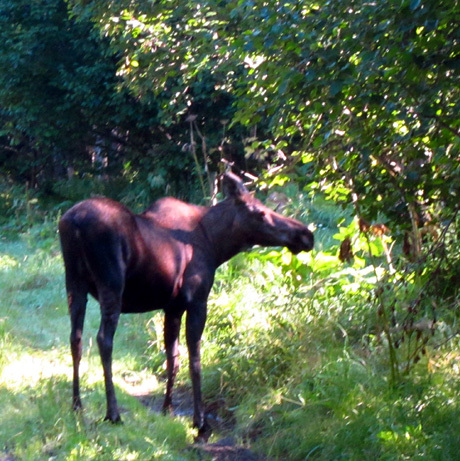 One of the highlights of Jim's ride was seeing two moose along the Coastal Trail. 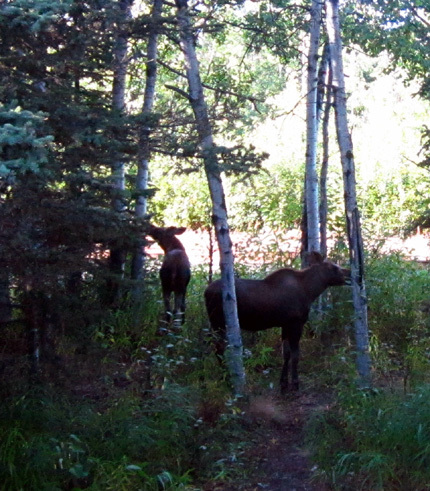 We also saw several different ones in various places on our bike rides along this trail in June and July. She was busy eating and didn't even look at Jim. 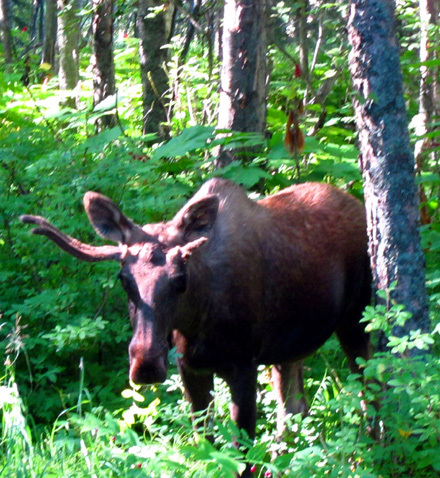 The second was the young male moose shown in the photo at the beginning of this entry. He was just a few feet off the bike path and posed nicely when Jim stopped to take his picture. Note the small antler that is broken. 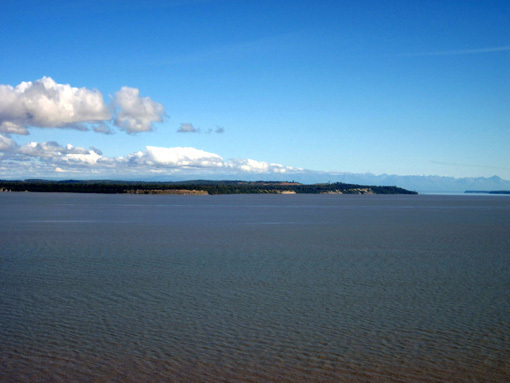 Another highlight was seeing several beluga whales in shallow water near Woronzof Point. 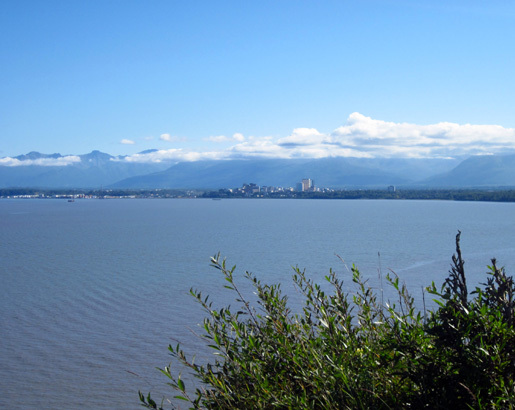 Beluga whales can be seen in Cook Inlet and Turnagain Arm in late July-August when the salmon return to spawn. 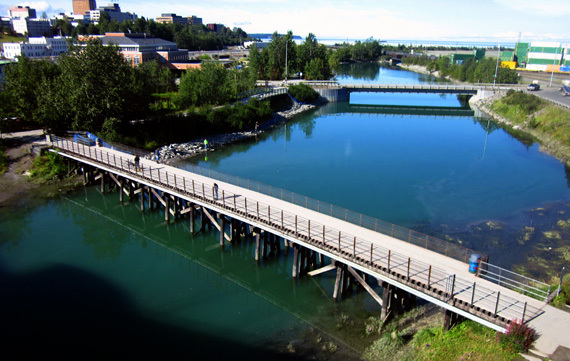 If we have another nice weather day before we leave Anchorage I want to drive down to Potter�s Marsh and Beluga Point and maybe I can see some beluga whales, too. 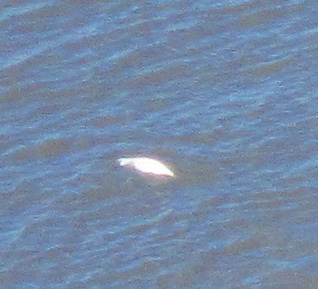 We saw several whales on our day cruise out of Seward in early July but they weren't belugas. 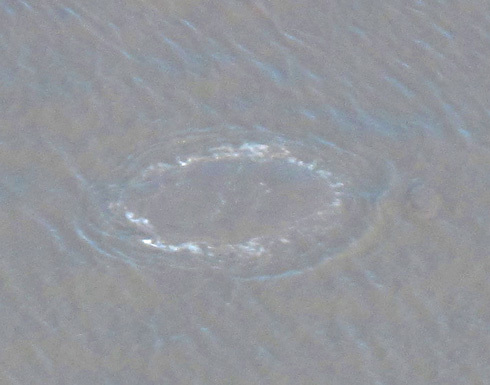 Almost twenty belugas got stranded at low tide in Turnagain Arm but rescued themselves when the tide came in again. That made today�s local news. The species is endangered so losing that many would not have been good. 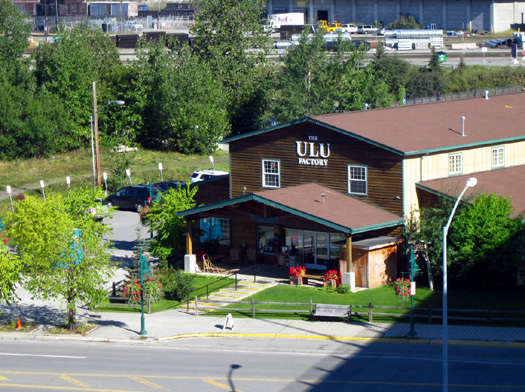 Their population in the Anchorage area is decreasing locally for various reasons. 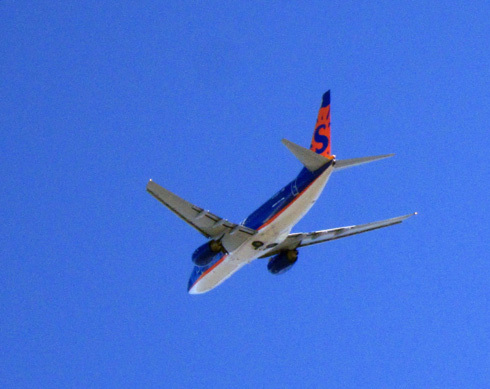 Jim also took this photo of a plane from The Point. 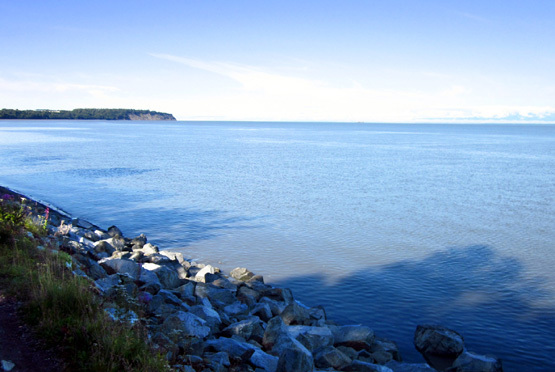 Passenger and commercial jets land on the runways of the metro airport very close to the Coastal Trail. 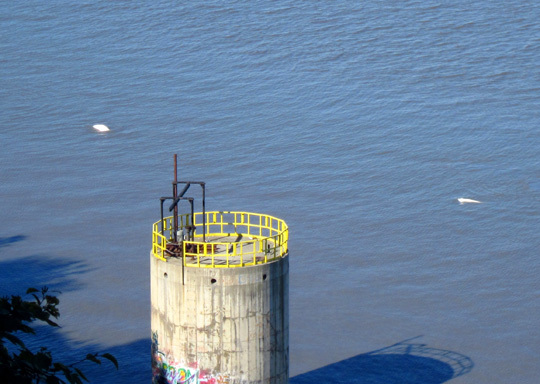 It's interesting to stand there for a while and watch them fly in and out. We watched for about 15 minutes as they methodically stripped whole branches of leaves. It was fascinating to watch and it's been interesting to see how the calves have grown since we first saw them in June (pretty sure it's the same family). (S)he could hear our voices and knew we were watching. Cody did some growling and barking inside the camper when the calves came so close. He's a territorial and/or protective dog when we're camping or at the house but he got quiet when we told him to. The barking didn't bother the moose. All three finally turned around and walked across the old RR tracks into the woods on the other side when the campground hosts drove by in their golf cart. Our presence didn't frighten them but apparently the golf cart did. THEY'RE BA-AACK . . .
We saw the trio again a few evenings later. They were wary of the barking but let me come outside to take their picture (I know, I know . . .) before wandering slowly off toward their mom in the clearing. 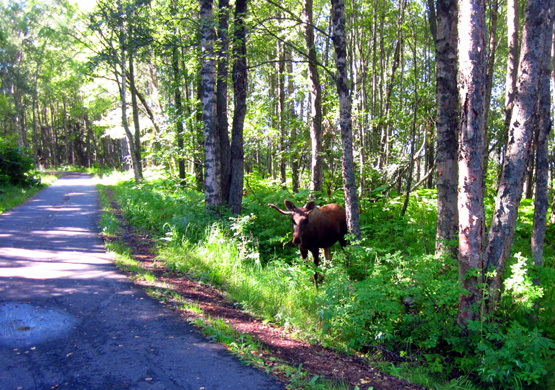 I wish I could pet a docile-looking moose like a horse but that wouldn�t be safe, even with these "city moose" that are so habituated to people. 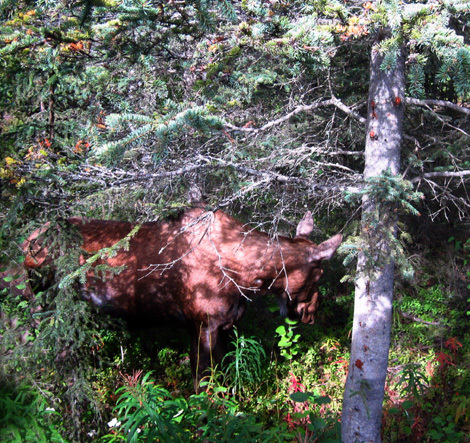 Moose are unpredictable and can be dangerous. 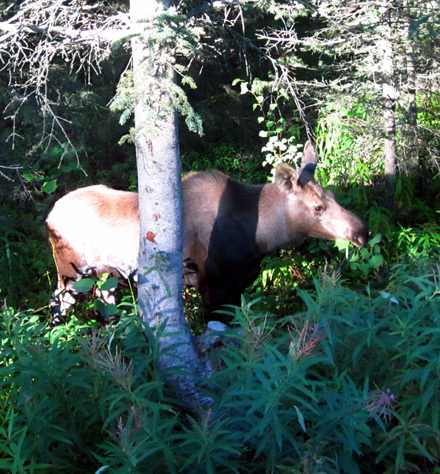 Although I've read that they aren't fond of dogs, I've never had trouble with any of my Labs on trails when we've encountered a moose while running or hiking. Cody has never growled or barked at one on a trail. He knew they were outside the camper the three times mentioned above but didn't growl until he thought they were invading our space when they were just six to eight feet from the camper. 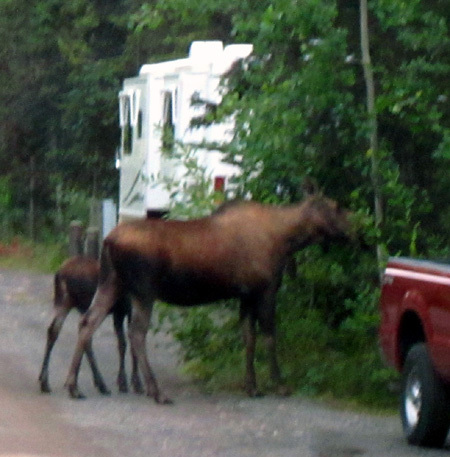 I�m glad Cody was inside when the moose family visited or we wouldn't have seen them. Two of the times he was outside just a few minutes before they came into our campsite.